Probably the most famous all the waterfalls in South America, and certainly the most visited. Iguazu Falls rests between Argentina and Brazil and can be enjoyed from both countries. These falls are distributed over a cliff edge that runs for over a mile and a half, with around half of this actually having water flowing over it, and the plume of water rising into the air can be seen from some distance away. The most famous viewpoint of the falls is known as the 'Devil's Throat', where you practically walk into the mouth of the waterfall, and the falls surround you on three sides. On the Brazilian side, visitors travel through the city of Foz do Iguacu, while the town on the Argentine side is Puerto Iguazu. Because of the popularity of the destination, you can get flights to these destinations from most cities in Brazil and Argentina, while there are plenty of coach connections too. The drop at this waterfall in the beautiful Torres del Paine National Park isn't as large as some other falls. However, the force at which a large volume of water is pushed through a narrow ravine before dropping into the basin below is impressive. Those getting an up-close view of the waterfall will feel its vibrations through the rock, while the large amount of spray adds to the drama of the scene. This waterfall is in quite a remote part of the country, so you can expect quite a journey to get an up close view of these falls. If you are planning to go hiking or climbing in the nearby mountains, it is a must-visit attraction. Puerto Montt is the nearest city for those visiting the area, and it has a small airport along with good links to the rest of the country. Although it certainly doesn't deal with the same volume of water as the Iguazu Falls, Cachoeira da Fumaca has recently been named the second highest waterfall in Brazil. While not the highest it has an impressive plume of water dropping over 350 meters into the pool below. Make sure that you are not visiting during the dry season, as the waterfall can dry up during this period, but for the rest of the year, it is a very beautiful waterfall. As the name suggests, during the drop down to the ground below, the water almost dissipates into a fog along the way. This is another waterfall difficult to reach. You must either walk four miles from the remote ecological base at Vale do Capao, or the fantastically adventurous hike over three days from the town of Lencois. A part of the ​Chapada Diamantina National Park. Another of the great waterfalls of the Amazon, this stunning two-step drop in the Amazonas province of Peru falls over 2000 feet down an almost sheer cliff face. The fifth highest waterfall in the world also has a reasonable amount of water pouring over the cliff, giving it a slightly more solid look than some like the Angel Falls where the water becomes a spray as it falls. Like many of the waterfalls in South America, it has only recently really become a well-known attraction having been discovered in a remote area. Getting to the waterfalls is usually via a stop at the town of Chachapoyas. While there is slightly more impressive accommodation, with great views of the falls found in a hotel around six miles away. The last few miles to the foot of the falls must be completed on foot. While the view is often obscured by fog and mist, but on those days when it can be seen in the sun, it is a truly spectacular sight. This popular Colombian waterfall is one of the most visited in South America. Tequendama Falls lies just over twenty miles away from Bogota. The falls have several steps and the water cascades from a narrow opening at the top into a wide pool at the bottom, falling over 425 feet. One of the best viewpoints of the falls is just a few hundred yards from the falls, where a historic mansion acts as the quiet guardian of the falls offering great views and an eerie insight into the long history here. Probably the most accessible of all of these waterfalls, you can travel most of the distance on a bus and take a short taxi ride. You can also save time and take the whole journey by taxi or car. Bogota itself has wonderful international connections with flight routes to many cities across North America and Europe, as well as a wealth of South American routes too. While the Angel Falls may be the highest single drop waterfall, the Kaieteur Falls are the widest single drop waterfalls in the world. Here water drops constantly over the 325 feet width of the falls. It also has beautiful green surroundings that make this a magical sight, with the basin below constantly filled with spray, rainbows dance on the droplets of water. The height of the falls is also impressive, as it is over four times higher than the Niagara Falls. Guyana does not attract the same amount of visitors as more popular tourist locations like Argentina, Brazil, and Colombia. 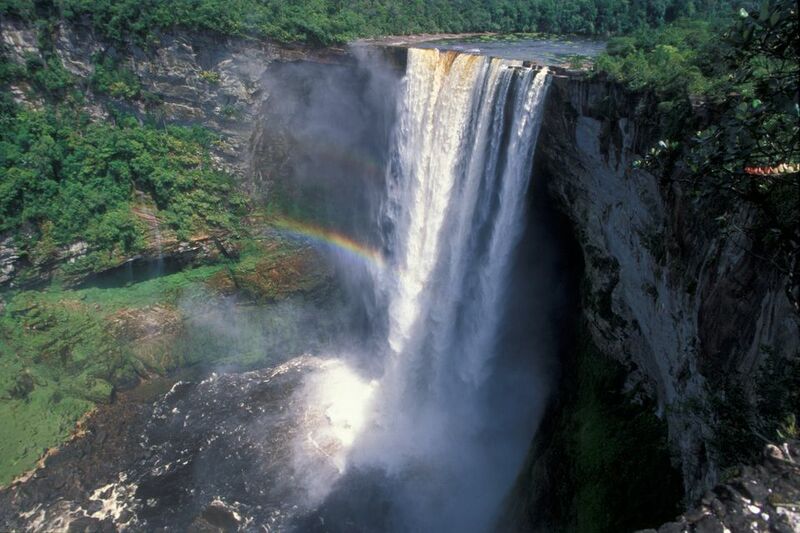 However, those tourists that do venture to Guyana often choose to visit the Kaieteur National Park. This trip is not easy and because of the remote location, it is very difficult to get to without taking a flight. There are regular flights from the Guyanese capital Georgetown into the Kaieteur Falls airstrip, which is a fifteen-minute walk from the best viewpoint of the falls.